LONDON: Bert van Marwijk has told the UAE he only has one thing on his mind: Getting the side to the 2022 World Cup. The former Saudi Arabia boss was unveiled as the new coach of the Whites before watching his new team beat his former team 2-1 in a friendly in Dubai (see right). While he was in the stand rather than the dugout — interim boss Saleem Abdelrahman took charge — he would have liked what he saw as he set himself the challenge of leading the UAE to their first showpiece since 1990. “I’m here for only one thing, and that’s to qualify for the World Cup,” the Dutchman said. 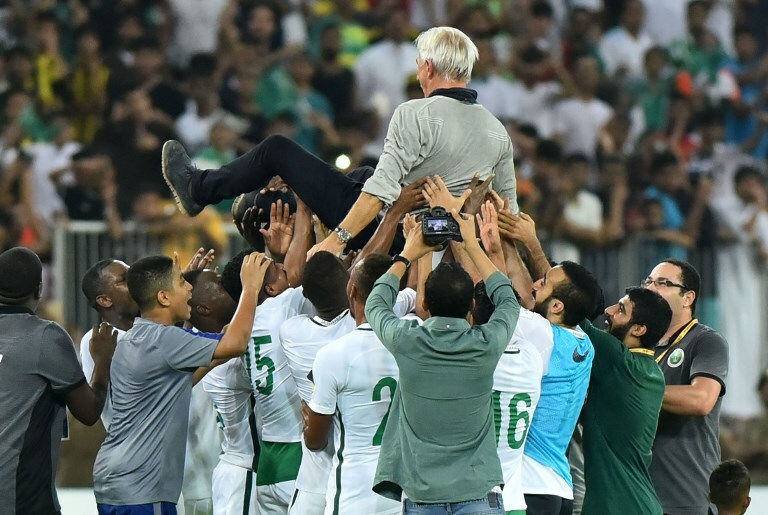 Van Marwijk guided Saudi Arabia to last year’s World Cup — the Green Falcons’ first appearance at the showpiece for 12 years — during a two-year stint which ended in September 2017. That was one of the key reasons the UAE fought hard for the 66-year-old and while it is never easy getting through Asian qualifying — 46 teams going for just four direct slots at Qatar 2022 — the Dutchman claimed his experience, combined with his knowledge of the UAE, will stand him in good stead. “The Saudis and the UAE are about the same level. With the Saudis we qualified for Russia, so we will do really everything to go to Qatar in 2022,” Van Marwijk said. While he is fondly remembered in the Kingdom — only a contractual dispute regarding backroom staff meant he did not stay on as Green Falcons coach for the Russia tournament — it is his time as the Netherlands coach that really stands out on his managerial resume. Van Marwijk coached the Oranje to within minutes of the World Cup trophy, with only an Andres Iniesta extra-time winner preventing him from tasting ultimate glory against Spain in 2010. So why did he return to the Gulf for another crack at World Cup qualification in a tough, crowded race? “One of the reasons is the feeling. I have to have the right feeling when I sign a contract,” Van Marwijk said. “We analyzed the UAE, we played four times against each other with Saudi, so I can see the potential. “I have had the experience to go to the World Cup twice. The first time we were second in the world, the second time was with Australia (which he coached last summer) and we were a little bit unlucky — we played very well. Van Marwijk is all too aware his task will be difficult. The “Golden Generation” of Emirati footballers, spearheaded by Omar Abdulrahman, tried and failed to make it to football’s biggest tournament, and a lot of the next three years’ work will likely depend on a new generation. “I heard there were some young talents, so I’m anxious to know how good they are,” the Dutchman said. “I know the team has a few very good players — the UAE has a few weapons.